Here is the full text of presentations expert David JP Phillips’ talk titled “The 110 Techniques of Communication & Public Speaking” at TEDxZagreb conference. All right. Ladies and gentlemen, welcome to my passion and to my love and, according to my wife, my mistress in life. Seven years ago, I embarked on a journey to analyze 5,000 public speakers from all over the world — amateurs and professionals — in order to distill and understand what makes a good speaker good, what makes a great speaker great, and what makes an outstanding speaker outstanding. The result: 110 core skills, with loads of sub skills. So what does it look like? It looks like this: These are the 110 core skills and the equation is simple. The more of them you fulfill the greater you are. 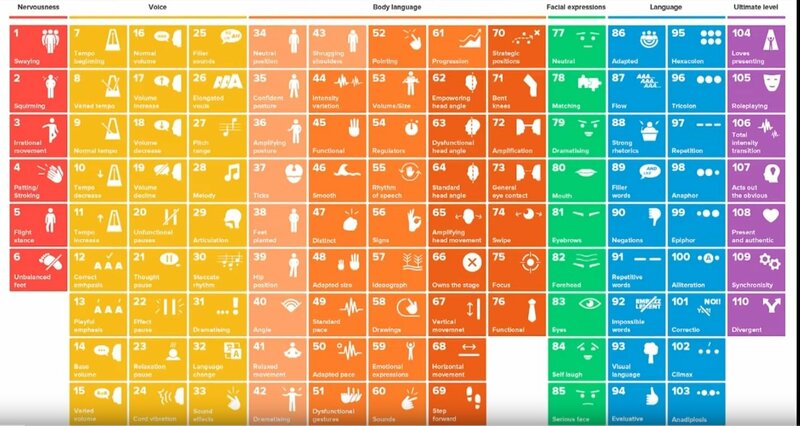 Now, 110 skills that’s quite a tad too many to go through in one TED talk; don’t you agree? So what I’ve done is I’ve picked out my absolute favorites, and I’d like to show you a demonstration of what it can look like. Imagine that this chair is something that you want somebody else to believe in, you want somebody else to buy into this. This is your idea. This is you wanting to make your voice heard. This gives you two options. Either you’re on this side of the chair and you’re a fairly mediocre communicator; you shoot from the hip, you hope for the best, and sometimes it works; sometimes it doesn’t. Option number two is that you’re on this side of the chair and you know exactly what you’re doing in every instance of time. You know that by taking a step forward you increase focus. You know that by tilting your head slightly to the side, you increase empathy. You know that by changing the pace of what you are saying, you increase focus. And you know that by shifting yourself lower, you increase trust. And you know that by lowering your voice, you get anticipation. And you know for absolute certain…(pause) that if you pause you get absolute and undivided attention. Now the question then is: Can everyone be on this side of the chair? Can everyone become good at these skills? What do you think the answer is? Of course, it is. Why? Because it’s called presentation skills, skills, skills, skills, skills, skills. It is not, has never been, and shall never be called the talents. You’re not born with a particular gene that makes you brilliant on stage. Something you acquire through life. Now as I said 110 skills that’s quite the number. So what I’ve chosen to do is I’ve picked out the five — would I say most important skills? Whenever somebody comes to me and they want coaching, this is what I focus on. And then I’ll actually give you four bonus skills at the end as well. Sounds OK? So let’s start with two of my favorites from body language which is Skill 34 and Skill 69 that is not intentional. Not 34 — what am I doing – what could I be doing differently in this case? Ladies and gentlemen, it is an absolute pleasure to have you here today, good of you to come. What should I have avoided? I should have avoided closing my body language because whenever a human being closes their body language it is a sign that they feel threatened in one way or another. So I should have continued with an open body language. So let’s have a look at Number 69 which looks like this: I’ll have to start up here. So when a presenter starts like this they go, what should I do better now?